Press TV- Iranian Foreign Minister Mohammad Javad Zarif says the European Union plays a crucial role in regional and international issues but can be more active in this regard. In a meeting with the Speaker of the Hungarian National Assembly Laszlo Kover in Tehran on Sunday, Zarif stressed the importance of showing initiative on regional and international affairs. “The policy of patience and wait and see will not provide an answer to global issues,” he added. He further expressed Iran’s keenness to develop cooperation with the member states of the European Union, including Hungary, and stressed the importance of Budapest pursuing a balanced policy on regional and international issues. The top Iranian diplomat further noted that Tehran and Budapest enjoy growing relations in various fields and called for banking transaction and visa facilitation in an effort to further strengthen cooperation. The speaker of the Hungarian National Assembly, for his part, said his country believes that the nuclear agreement, known as the Joint Comprehensive Plan of Action (JCPOA), signed between Iran and the P5+1 group of countries in July 2015, is beneficial to all states and nothing must hinder its implementation. As the Islamic Republic has remained committed to the nuclear deal, other sides must also fulfill their obligations under the JCPOA, he added. Iran and the five permanent members of the UN Security Council – the United States, Britain, France, Russia and China – plus Germany started implementing the JCPOA on January 16. Under the nuclear deal, Iran undertook to put limitations on its nuclear program in exchange for the removal of nuclear-related bans imposed against Tehran. 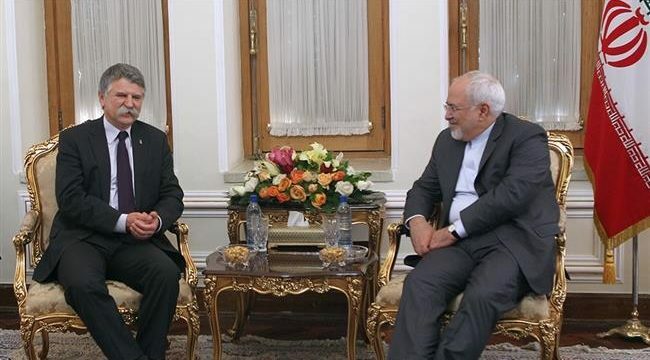 Kover also invited the Iranian foreign minister to pay a visit to Budapest and said his country regards Iran as a strategic partner and seeks to boost mutual ties. The top Hungarian parliamentarian arrived in Tehran on Wednesday at the head of a high-ranking politico-economic delegation and held talks with senior Iranian officials including President Hassan Rouhani and Parliament Speaker Ali Larijani.